WASHINGTON — Texas junior U.S. 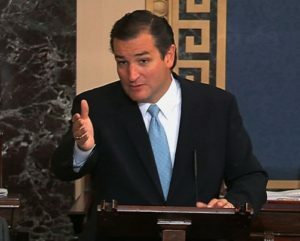 Senator Ted Cruz pulled an all-nighter to make a political statement about the impending implementation of ObamaCare. He took the Senate floor yesterday and has not let up since. Reuters reported  that he’s already logged over 18 hours of speech time and used the opportunity, as his colleague from Kentucky Rand Paul did over drone strikes, to blast ObamaCare. Cruz, among other things, called the health care law the “biggest jobs killer” and that “ObamaCare isn’t working” for Americans. Senator Mike Lee of Utah, another freshman senator, helped spell Cruz during his speech into the night. Marco Rubio of Florida also gave Cruz a brief break. He started talking at 2:41 pm EST Tuesday and is similar to a filibuster, which is a procedure used to block legislation. But, this is an opportunity to express his views on ObamaCare until noon, where he must yield the floor for a vote on keeping the government funded. The dispute is over the House GOP bill to defund ObamaCare  while funding the government, an action that the Obama administration and the majority Democrats in the Senate refused to consider.